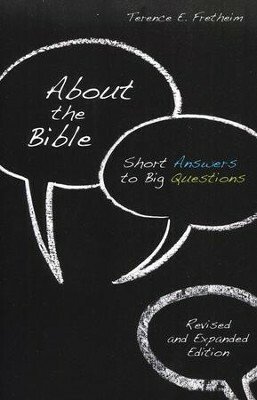 In this newly revised and expanded edition About the Bible: Short Answers to Big Questions, Terence E. Fretheim offers straightforward answers to reoccurring questions about how the Bible was written, organized, and interpreted - and why people have such different opinions about what the Bible has to say.Built on a bestselling volume first introduced to readers in 1999, this edition welcomes added questions to a unique question-and-answer format. Among the questions are: Who wrote the Bible? How did it come to be? Do Lutherans believe in a literal interpretation of the Bible, for instance the Creation Story? Can we draw responsible ethical discernment from the Bible? How do we read the Bible for spiritual growth?Arranged according to topic, the books is ideal for individual and group use. Both devoted Bible readers and Bible novices are sure to find answers to many of their biggest questions here. Terence E. Fretheim is Professor of Old Testament at Luther Seminary in St. Paul. Fretheim is the author of The Suffering God (Fortress Press) and coauthor of The Bible as Word of God (Fortress Press). In this newly revised and expanded edition About the Bible: Short Answers to Big Questions, Terence E. Fretheim offers straightforward answers to reoccurring questions about how the Bible was written, organized, and interpreted-and why people have such different opinions about what the Bible has to say. I'm the author/artist and I want to review About the Bible: Short Answers to Big Questions (Revised and Expanded Edition).